Where should I start with trail reviews for Central Oregon? Well, from the beginning, that’s where. 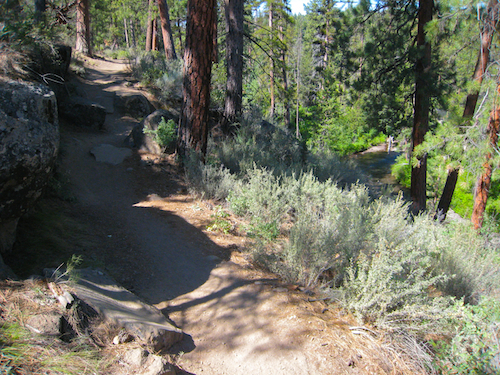 Bend, Oregon’s Shevlin Park is one of the crown jewels of the Bend park system. 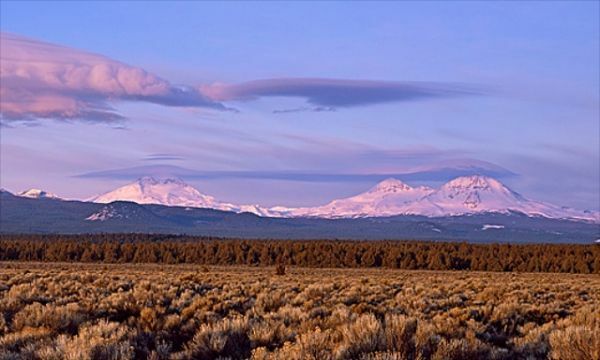 Less than 5 miles from the core of downtown Bend, this woodland park offers impeccable diversity, and it is all close to the heart of Central Oregon. From downtown Bend, drive west on Newport Avenue which eventually turns into Shevlin Park road without any rhyme or reason. About 4 miles west of the Deschutes River, You’ll drive(or hopefully bike ) down a steep hill, into the Tumalo Creek Basin. Aspen Hall is on the right(where the weddings are) and the important trail heads are on the left, as are the parking lots. The above sign is clearly visible from the main parking lot at Shevlin Park. Following the road into the park quickly leads to the informational bulletin board seen below. There is a map on the park bulletin board, but it’s not easy to read and it is not at all detailed, partly justifying this trail description. 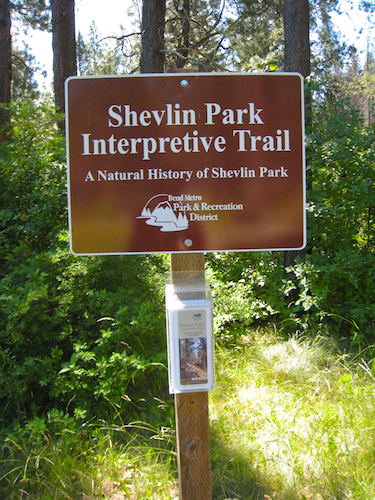 Shevlin Park information bulletin board, this attractive sign serves as the start of the Shevlin Park loop trail. 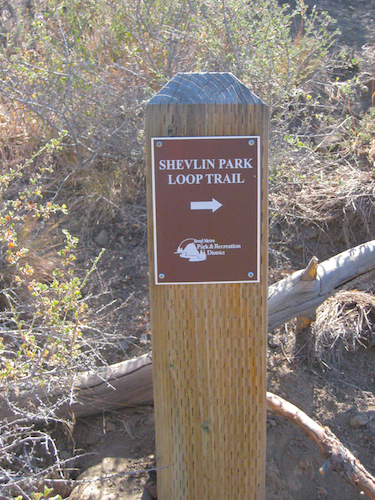 Of the possible running , biking, or hiking loops in Shevlin Park, I prefer the “Shevlin Park Loop”. It is about 6 miles long according to the park signs. According to my P.R. for this loop, I’d say it is more like 5.75, but that is trifling. 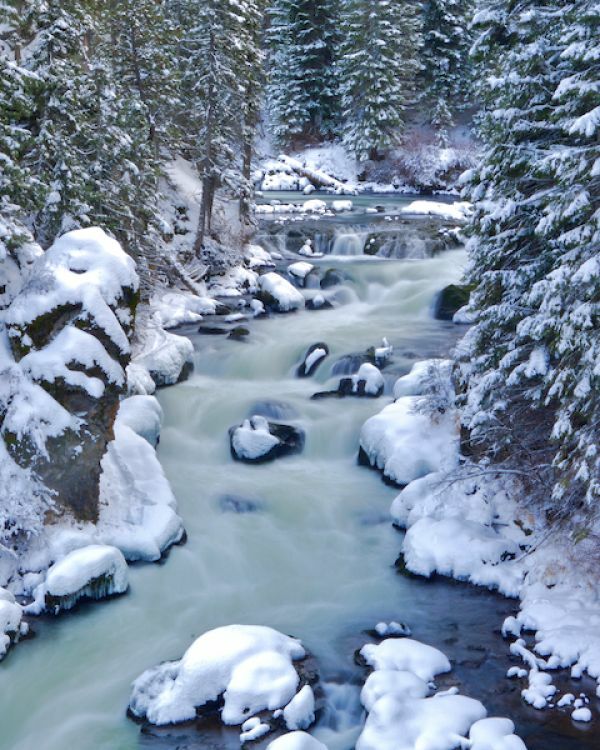 The “Tumalo Creek Loop” is shorter and less interesting but at about 2.5 miles long, it is a viable option for walkers or families with children. I prefer to run this loop clockwise for several reasons. 1. This gets a steep hill out of the way at the beginning of the run. 2. This direction gets one of my less favorite parts of the loop out of the way early on. 3. Going clockwise completes the hottest, most sun-exposed part of the run near the beginning of the loop, before I’m hot all lathered up. Assuming that you heed my advice and go clockwise, you will proceed to the trail which is immediately to the left of the sign above as the trail runner in the following photo is doing. The trail drops into a beautiful aspen grove photo which in some autumn seasons is brilliant with golden foliage. At the end of the aspen grove, turn left directly towards Tumalo Creek with the aspen grove on your left and the meadow on your right. 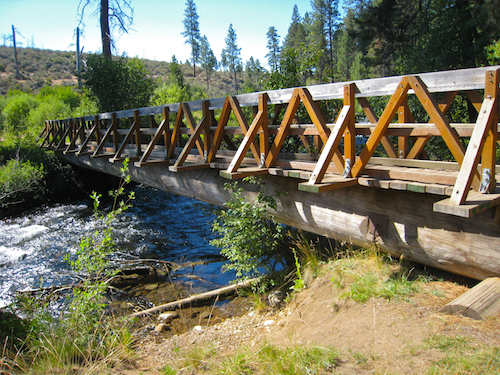 After about 100 yards, you will see and the following foot bridge over Tumalo Creek. 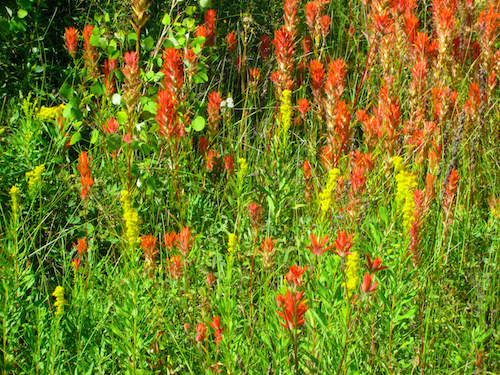 The trail passes by a excellent grouping of indian paintbrush which are at their peak in early July in most years. 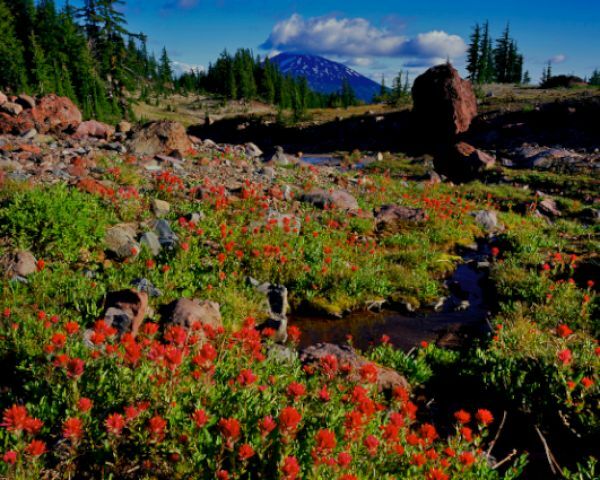 Wild Indian paintbrush near the beginning of the Shevlin Park Loop trail. 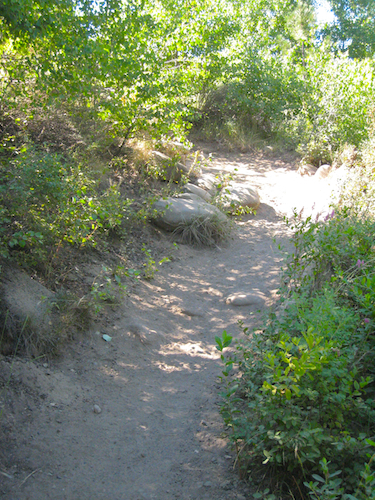 Immediately after the Indian paintbrush, the trail begins to rudely climb up a rather steep but brief hill. Below is the hill leading up the high dry side of Tumalo Creek. 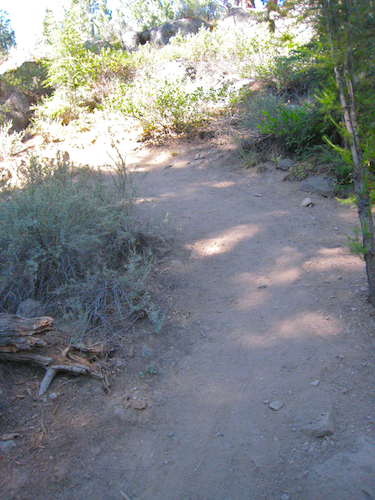 A deceptively steep trail up to the dry, east side of Tumalo Creek. At the top of this short, dusty hill, you begin what I consider the least attractive and most sun exposed part of the Shevlin Park loop trail. It is hot and dry high desert terrain lined with sagebrush , bitterbrush, and desert wildflowers in the spring. There are few trees for the next 0.75 miles of gradual uphill trail. The first of many 4×4 Bend park signs directs you to the right. Head their advice down this sun scorched section of the route. At about 0.25 miles from the parking lot, you’ll see the following sign which should build your confidence that you are heading in the correct direction. Shevlin Park sign, continue the 5.75 miles back to the parking lot! 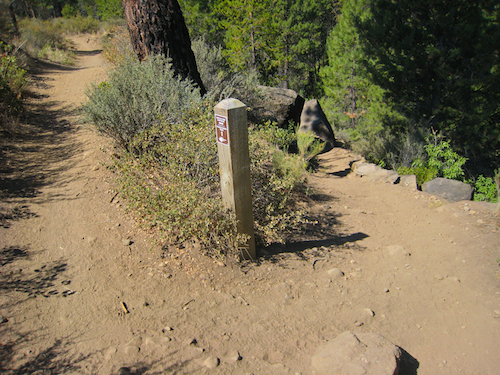 From hear continue on the single track with high desert on your left and ponderosa forest on your right until you hit the following fork in the trail, where the shorter “Tumalo Creek Trail” heads down hill to the right and the longer “Shevlin Park loop Trail” continues on the left side of the obvious trail marker. For those of you trail runners, I recommend you stay to the left. 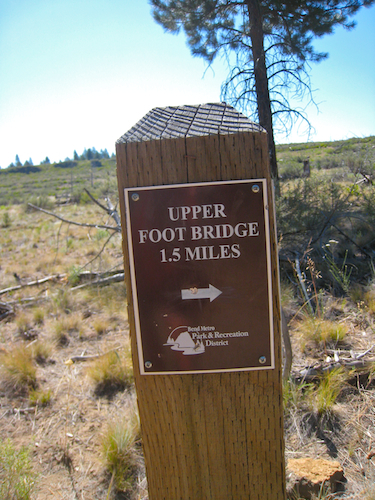 Follow this sign to the upper foot bridge at the far end of the Shevlin Park Loop Trail. Continue southward for another 0.25 miles until you reach another fork in the trail where the double track goes left and the single track goes off to the right. 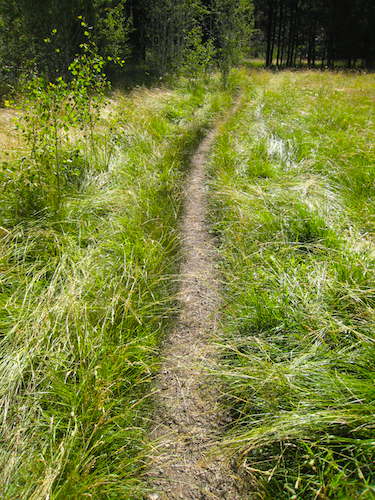 Follow your instinct and take the single track to the right. 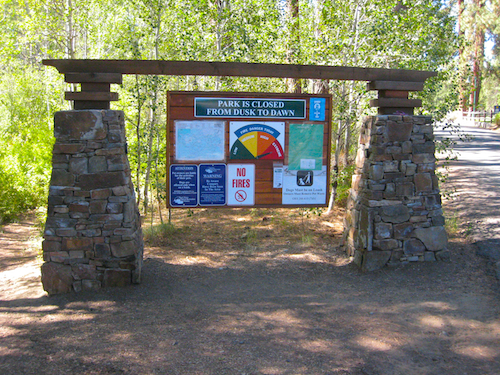 The park sign at this fork indicates that the upper foot bridge is 1.25 miles and the park entrance is 3.4 miles away if you continue on the Shevlin Park Loop trail. Follow the trail as this is where the awesome part starts. You’ve traveled about 2.5 miles so far through high desert and you about to hover through a wooded wonderland of mixes evergreens heightened by a chorus of babbling brooks. Sweet! At this fork in the trail, follow the park sign to the upper foot bridge and enjoy some some excellent trail running through sylvan surroundings. Stay to the right at the above sign and you won’t be disappointed! The views are rockin! Heading downhill now, you’ll cruise through old growth pondos with Tumalo far below to your right. The shade of this delightful wood area will carry you the rest of the way. The next image shows some great trail and great terrain. Some awesome trail running territory . Who can complain about the combo of Old growth ponderosas and live water on this stretch of the Shevlin Park Loop Trail. Continue this slightly rugged and viscerally blissful trail and soak in the scenery as you glide downhill where you come to the following fork in the trail. 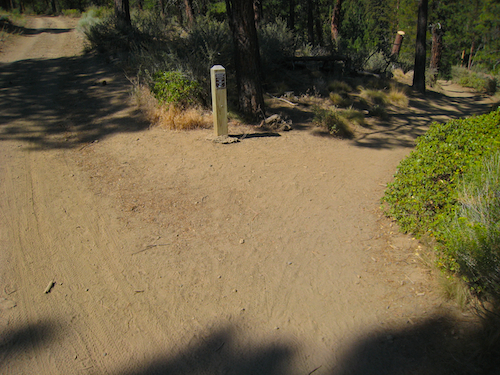 Fork in the Shevlin Park Loop Trail. Stay to the right! At the above fork, stay to the right(as is often the case when running this loop clockwise) and head down hill until you intersect the riparian shores of a small stream that is a tributary of Tumalo Creek. 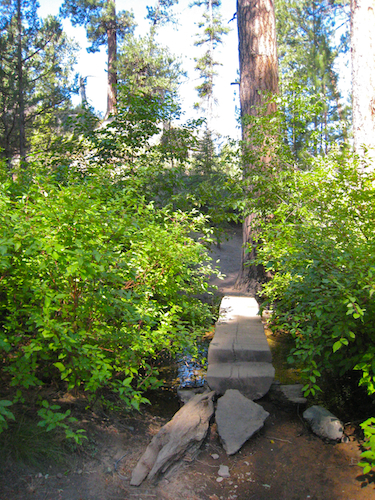 At the stream, head left and upstream to the small log foot bridge pictured below. Despite the diminuitive size of this bridge, I’ve never found the stream to be un-crossable here. This is an easy place to get lost on this loop. I’ve done it. Don’t laugh! I’ll wager that most trail runners have been temporarily lost on the Shevlin Park Loop Trail and this location is one of the culprits. The key to avoiding embarrassment, or worse yet, becoming Cougar bait, is immediately head up hill and slightly to the left, Do not follow the stream to the right. You will get lost! 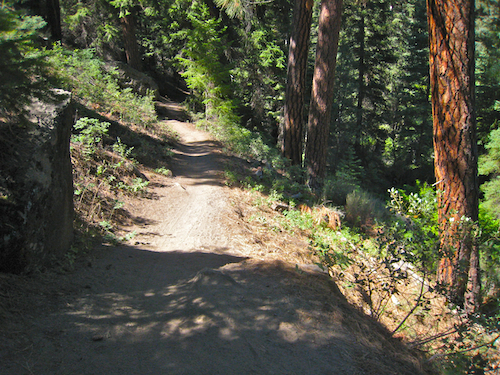 Below is a shot of the trail as it quickly climbs uphill after crossing the small log footbridge. Trail climbing upward after crossing the small log footbridge over a tributary of Tumalo Creek. After a short yet challenging climb the trail enters another beautiful section with the gurgling Tumalo Creek down to the right. Notice the varieties of trees(more later) and the density of vegetation. 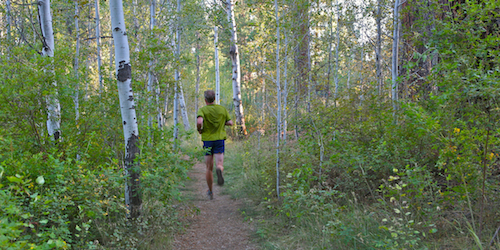 It’s a stupendous change of pace for a Central Oregon trail runner during the heat of summer. On hot summer days, this section is like entering into a cool rain forest. Yet another scenic section of trail along the Shevlin Park Loop Trail. In Autumn, this section of trail can be absolutely aflame with fall color. Stream side Red osier dogwood and golden needled larch trees in their seasonal regalia can make for a truly amazing autumn run. For some beautiful photos of Shevlin Park in Autumn click the following link and and enjoy Shevlin at its seasonal best. Shevlin Park in Autumn. 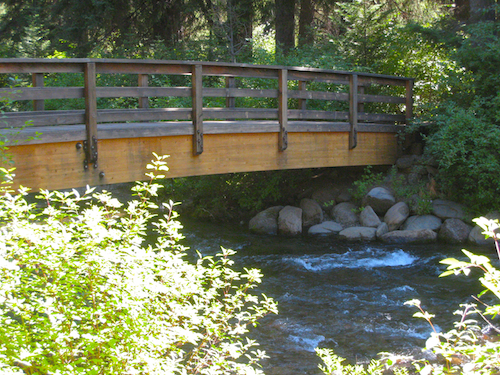 Proceed downhill along this glorious and rambling stretch of trail until you arrive at a riparian wonderland where you will cross the handsome foot bridge pictured below. Below is the view upstream from the footbridge. Excellent! 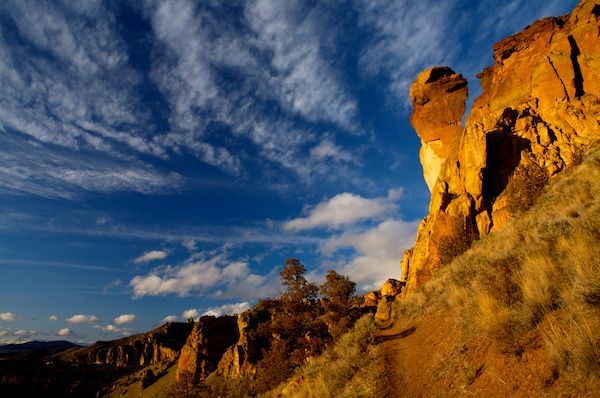 This exceptional area of Central Oregon makes the whole trail worthwhile. I think many Bendites take it for granted. Not me. Lush, diverse and beautiful, it’s got something for everyone. This is a good place to to talk about getting lost again. I really do know many Bend residents , including me, who’ve been what I consider mildly lost in Shevlin. Because this is a city park and it is not considered “backcountry” I think most people keep their “lost in Shevlin Park” stories to themselves. For those of you who aren’t too proud, please sign in and tell me your best story of being lost in Shevlin Park and preferably indicate where you think you were lost at, unless you are like my loving wife and you continue to get lost at the same place repeatedly and you never remember where it is! Have any of you gotten lost in your own basement? I know someone who has! 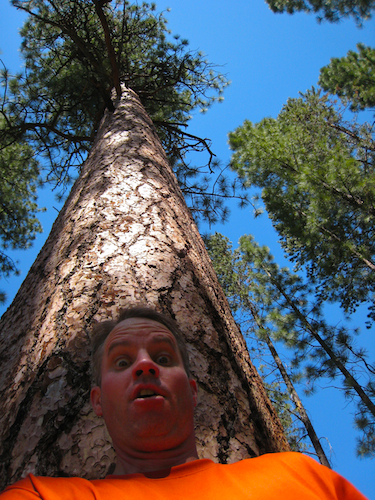 So, don’t be ashamed, and please share a Bend initiation story of being lost at Shevlin Park. Okay, from the footbridge, proceed west where you soon hit a trail junction. 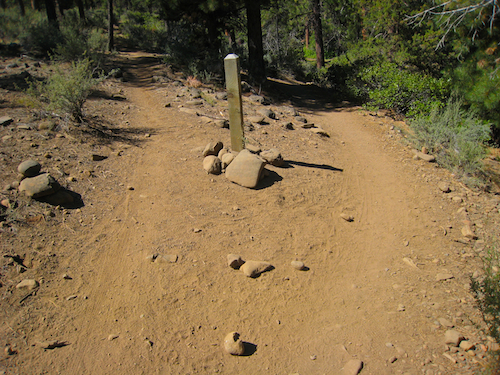 Follow the sign below toward the Shevlin Park entrance. 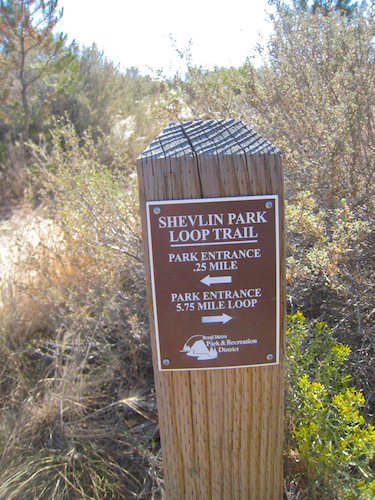 Follow the park sign towards the Shevlin park entrance. With only 2.2 miles of blissful sylvan single track ahead of you, you should thoroughly enjoy the rest of this trail run. From this point onward, the trail is not terribly well marked with many small side trail that lead to streams edge and even double track trail leading back to the main road. I prefer to stay as close to the water as possible. 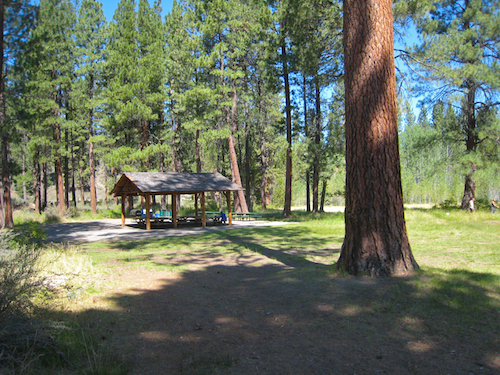 If you are new to Shevlin Park, it is easy to take a wrong turn at some point. The worst that can happen is that you will be duped by a small side trail which will take you back to the main paved road or you could be led to a dead-end at water’s edge. In either case you can backtrack and re-gain your bearings. From the above sign post, you are about 0.5 miles from the Fremont meadow, a pleasant open grassy area where events are occasionally held and where there is a toilet for those of you with G.I. distress. Fremont Meadow is presumably named after John C. Fremont who was a famed explorer and cartographer of the American West. In addition to exploring much of the Oregon Territory and the Oregon Trail, Fremont was also the first American presidential candidate of a major party to run on a platform that was in direct opposition to slavery. I suppose he does deserve a meadow! Remember to return your brochures at the end of your interpretive walk, unless of course you were stricken with gastrointestinal distress and the toilet was out of T.P. in which case, the brochure is all yours! 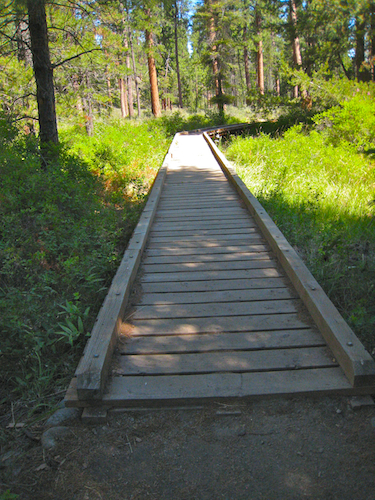 The next leg of the Shevlin Park Loop Trail is a pleasant mix of board walks over wetlands and singletrack through old growth ponderosa forests. Old Growth ponderosa forest split by single track in Shevlin Park. Nice! Beyond the wetlands area, the trail migrates close to the paved car road and eventually you are forced onto the road very briefly at the Hixon Crossing covered bridge pictured below. The bridge is very attractive and a worthy destination in and of itself despite the fact that it could currently use a good coat of paint. As the Shevlin Hixon mills sold out to Brooks Scanlon in 1950, it seems unlikely that any logging money will be underwriting a new paint job for Bend’s favorite covered bridge anytime soon. 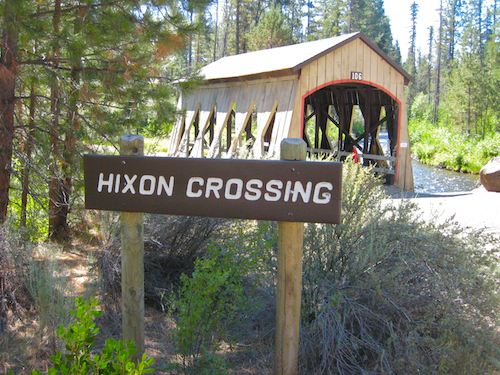 Once you arrive at the Hixon crossing bridge, I recommend you cross it, proceed straight for about 50 yards and then go left at the fork in the trail. Crossing the bridge at this point avoids the knee pounding pavement that would be encountered by continuing straight and you get to enjoy another of Shevlin Parks many bridges.. After turning left at the fork, proceed downstream until you see the bridge then cross the bridge and you will come out in “the larch grove” which is pictured below. 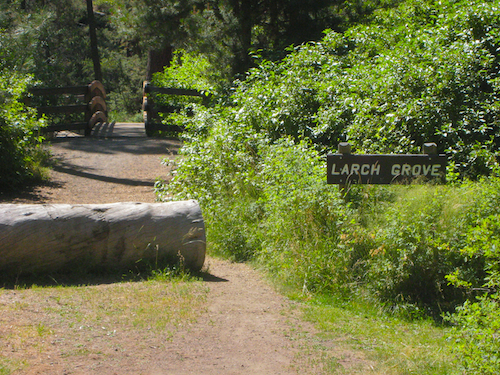 Beyond the larch grove, stay to the right on single track close to the stream’s edge. 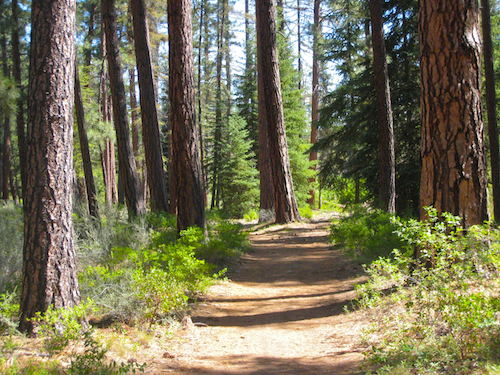 the rest of the trail is a pleasant romp through old growth Ponderosas. 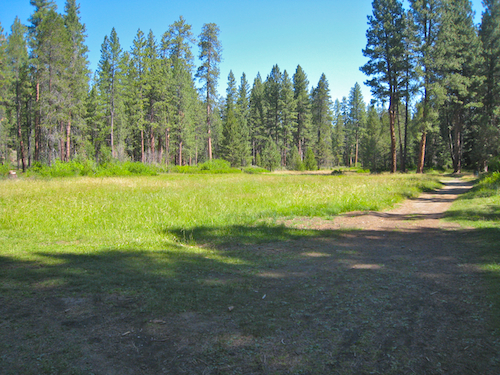 All too soon the trail enters the picnic meadow pictured below which is adjacent to the Shevlin Park entrance. 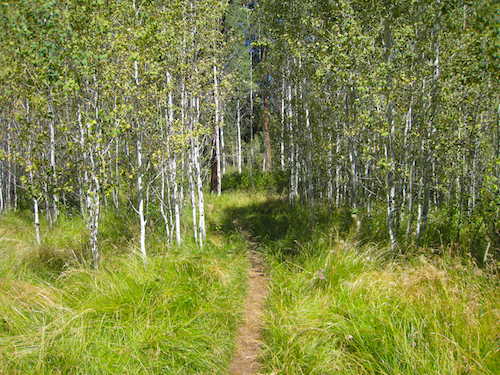 The trail cuts through the meadow and into the aspen grove pictured below and quickly empties out at the trail head by the Park’s informational sign where you first started your glorious trail run. You will soon see your parking lot and hopefully your car/bike/ skateboard/mode of transportation. 1.While there are still trees strewn about by the new years storm of 2009, the trails are entirely clear of down trees as of August 2009. 2. During the spring thawing season, trails can be quite muddy, with some puddles that are impassable for those with an aversion to water. If you are willing to get a little wet, you should be fine. 3. Even after winter snow storms, Shevlin Park is usually runnable. I would however suggest that you invest in a pair of “Yaktrax”, available at Footzone, and probably at Fleet Feet and REI. My yaktrax have served me well in Shevlin Park snows. 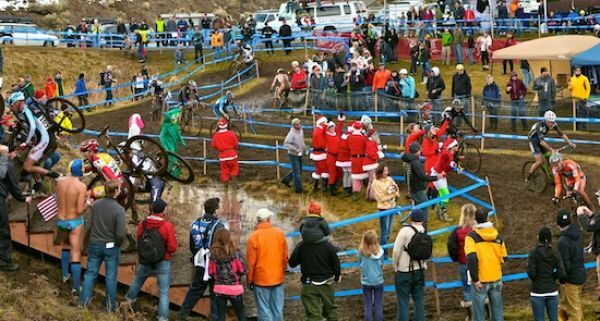 Finally, here is where you the reader, runner, biker, hiker, competitive picnicer come into the equation. We want your comments. 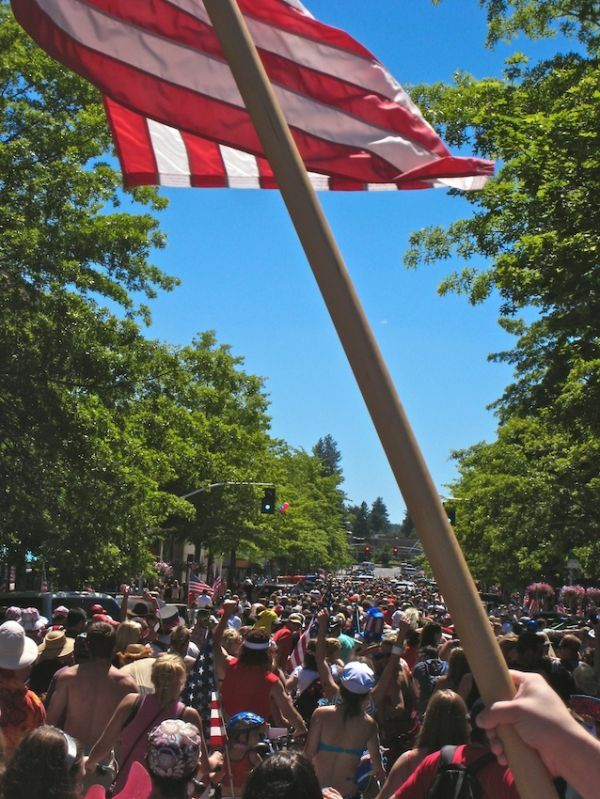 To make this site a comprehensive online trail community for Central Oregon we need your comments at the end of this entry. Please register, and give any trail updates from your most recent Shevlin Park outings. Are there trees down, are the toilets overflowing, has a nudist colony taken over Fremont meadow Or do you just want to tell me that I’m not funny? We Bend Wild trail enthusiasts want to know, so if you have any important info, please share in the comments section found below. It’s the constant and slightly irreverent trail updates that will make this site a great online-trail community for Central Oregon! Thanks for visiting, return often, and happy trails. Love your site…always ran at phil’s trail and that is nice but this is really a great place to run thanks for all the beta! Great overview on Shevlin Park. Thank you for creating very good photos and associated notes ! I found your website while trying to find an answer to the following question — “Is there more than one entrance to Shevlin Park?” After reading your trail description, I’m assuming there is only the one entrance; I never make it all the way through the park (I’m a senior citizen), so I was hoping there was another entrance at the other end of the park, so that I can see what I’m missing. Someone told me there was one at Skyline Drive (wherever that is). Love this article on this park. Have family that seattled in Oregon. Did visit once but didn’t get to see this park. Thanks for letting me tour without leaving my computer chair. A friend’s GPS clocked this run at 4.6 miles. I REFUSE to believe it, and stand by your blog post here, instead. 😉 Thank you for taking the time to document the route with descriptions and photos. I have sent many runner friends to this post to help them get confidant with their own ability to navigate the run. My favorite run in Bend, hands down. Thanks for your comments and kind words. Shevlin really is a gem. We are spoiled. I ran there yesterday and it was stunning, as always! Old growth ponderosas, aspen groves, varied terrain, footbridges, good footing, water the whole way….What more could a trail runner ask for? Thanks Again! Sorry for the belated reply. There is only one true entrance to Shevlin park, off of Shevlin Park Road. Thee is another access point which starts upstream and outside of the park. To get to this starting point, drive west on Skyliners drive and take a right on NF 4606. There are parking spaces near the bridge and a trail which goes back to Shevlin Park and a trail which goes upstream to Tumalo Fallls. 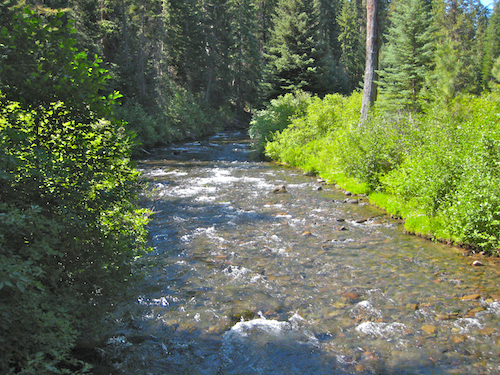 Here is a link to the Google maps for the area.https://maps.google.com/maps?q=tumalo+creek+trail&client=safari&ie=UTF-8&ei=RG7lUun6Ion7oATKloGoDw&ved=0CAsQ_AUoAw. By the way, I believe the informational sign at the parking lot for Shevlin Park now has accurately marked mileage signs. 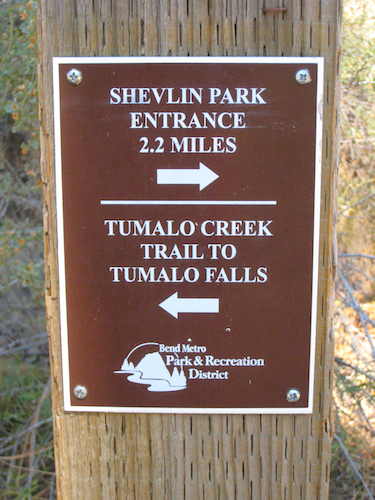 If I recall, the “Tumalo Creek Loop” is 2.5 miles if you start at Aspen Hall and return there. Cas, Thanks for the comments. I’ve hiked and run in Shevlin so many times and loved it every single time, that I thought I should give something back. We are happy the share and truly appreciate you feedback.